Put an end to slipping pillowcases and spice up plain covers by adding some fabric to your pillowcases and creating an envelope. If you dislike using pillow covers or shams, this is also a great way to add colour to your existing pillows that will enable you to get rid of your pillow shams! Cut off the open end of your existing pillow case just past the wide seam. Cut fabric in your accent colours to replace the amount that was cut off of your pillow and allow for seam allowance (2.5 cm is generous for each seam). You are aiming for 3 pieces of fabric the same width but one piece being a little longer than the other 2. I will refer to the pieces A, B and C as seen in the diagram below. Piece B will be longer and piece B and C will have a hem. I used two different colours for piece A.
Sew a hem on piece B and C.
Sew piece A and B together length wise at the raw edges. Iron in half at the seam to create a crisp fold. Piece A and B sewed together. The hem of B is at the top of the image. Sew piece A/B together with piece C at the side. 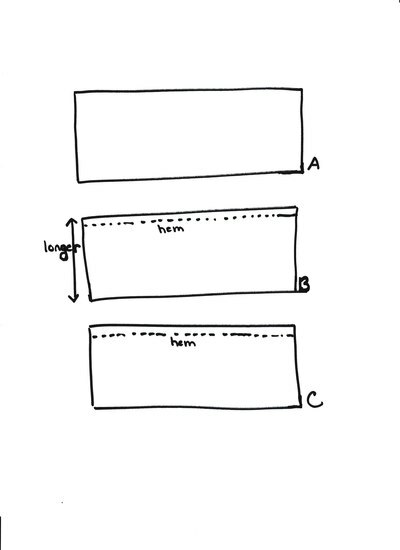 You will want the hem for piece C to be even with the fold you created out of piece A/B. Fold of piece A/B and hem of piece C is at the top. Pin in your fabric to the pillow case allowing piece B to fall down (you do not want to sew this in the pillow seam). Fold piece B back and finish off the side seam. Insert your pillow into the pillowcase. You now have a neat envelope to keep your pillow contained! Back of pillow with envelope. Feeling inspired to update your bed linen further? Check out how to make your own duvet cover.